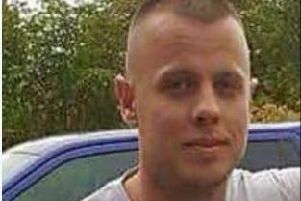 Detectives investigating the murder of a Barnsley man have issued a new appeal for information on the two-week anniversary of the killing. Gary Dean, aged 48, was found dead in woodland near to his home in Moorend Lane, close to the Trans Pennine Trail in Silkstone Common, Barnsley, at 5.40pm on Tuesday, September 6. A post mortem examination revealed that he had been seriously assaulted. At the spot where Mr Dean’s body was found, Detective Chief Inspector Steve Whittaker said: “Today marks two weeks since Gary was killed and our investigation continues in earnest to discover what happened to him. “We know that Gary was found with significant injuries in a wooded area near to the Trans Pennine Trail, where we are carrying out further searches today in a bid to identify further clues as to what might have transpired two weeks ago. A poster has been produced by South Yorkshire Police showing the distinctive red running top Mr Dean was wearing when he was killed. DI Whittaker added: “As part of our renewed appeal today, we have released this poster that shows the distinctive red running top that Gary was wearing when he was last seen leaving his home address in Moorend Lane at around 7am that morning. He never returned home. “While Gary was a keen runner and cyclist, we don’t believe he was going out for a run that morning as he was wearing trainers and beige cargo shorts with this red running top. “I’m still keen to hear from anyone who may have seen Gary on Thursday morning, but I’m also interested to hear from anyone who knew Gary and hasn’t yet spoken to police. A 40-year-old man arrested on suspicion of murder and a 76-year-old woman arrested on suspicion of assisting an offender have been released on bail. Anyone with information should call the police incident room on 01709 443544 or Crimestoppers on 0800 555111.